This Memorial Day weekend when you are spending time with your family please remember to teach your children and grandchildren about our brave men and women who have lost their lives in service for our freedom. Let's especially remember their families in prayer. This video below is for Veterans' Day, but I think it is very fitting for Memorial Day. At the beginning of our religion class, we say the Prayer of St. Ignatius of Loyola. St. Ignatius asks the Lord for nothing but His love and compassion. We ask God to take all of what we have because God is all we need. He gives love, understanding, and guidance. God gives these things and we offer them back as an offering. God alone and His presence is all we need. I don’t need any material possessions or anything else in order to have a relationship with God. To have a relationship with Him, all I need to do is ask for His unlimited love, grace, and compassion and He will give it to me. God is willing to provide me with whatever I may need as long as I just ask and follow Him. Consider the Centurion in the Scriptures. The Centurion's humility was overwhelming. To expect Jesus to actually go out of his way to go to his house and heal his servant was way beyond him. So, all the Centurion asked was for Jesus to say the word. Think about it, all that this symbol of power asked was for Jesus to just say the word. If that was not humility, I don't know what that was. And had Caesar learned that his soldier submitted himself to someone's "word," that Centurion's head would roll in no time! At that time, only Caesar could "say the word" and everything moved. See? It was humility. How many of us have such kind of humility these days? Think about it, if that Centurion had that amount of love for his servant, how much more love do you think he had for his own family? Think about it. May we all have twice the faith, love and humility of that Centurion. Founder’s Hollow gave me a glimpse of God’s creation last week. The animals and the ponds opened a window to God’s loving personality. All of His work breathes love for us. As I walked, I came across the newly hatched swans in the upper pond. The nurturing and protective care of the mother swan was quite evident to these awkward grey fledglings. Three aggressive geese approached the new creatures and the mother warded them off without hesitation. God’s caring and loving personality speaks to us through nature. No matter what the situation, God will always protect us from the “geese” of evil, he will always step in for us when we are down and weak and fragile. Joy is something that is unaffected by circumstances. It is a state of mind and an orientation of the heart. Joy is deep. It is a settled state of contentment, confidence and hope. 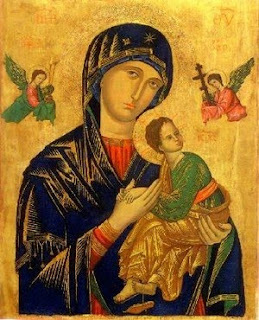 "What appears to me to be without precedent among the known institutions is, I repeat, that it is in the name of Mary and for her glory that we embrace the religious life; it is in order to consecrate ourselves, all that we have and are, to her to make her known, loved, and served, in the intimate conviction that we shall not bring men back to Jesus except through his Most Holy Mother, because with the holy doctors we believe she is our only hope—tota ratio spei nostrae—our mother, our refuge, our strength, our help, and our life "
"We must win clients for the Blessed Virgin . . . and let those with whom we live understand how sweet it is to belong to Mary . . . For such must be our zeal that, whilst working at our own perfection, we also induce others to follow in our footsteps." This weekend there is a vocation retreat at Founder's Hollow. Please pray for those young men on retreat who are discerning a religious vocation to the Marianists. May the Father and the Son and the Holy Spirit be glorfied in all places through the Immaculate Virgin Mary. Amen. you will become more skillful in inspiring others with it'"
So our prayer needs an interior element and we do indeed need to pray, so how to we do that? Jesus teaches us how. Jesus doesn't say, these are the words you say when you pray, but gives a how-to. The inside (our hearts) should match the outside (our words). When we say "Our Father who art in heaven" we proclaim the reality that God is not my father, but our father; we are united together in a common humanity. We also proclaim that we are adopted sons and daughters of God and the existence of heaven, which isn't a place where we polish our halos and tune our harps, but heaven is a place of eternal joy and communion with God. All the while, when we pray these words on the outside, our hearts should be lifted up to the Lord, they should raise up to Our Father, who art in heaven. Our focus and concentration should be not on the job we have to do when we're done praying or the grocery list or the Olympics, but on Our Father, who art in heaven. When Jesus teaches us how to pray, he doesn't just teach us what to say but teaches us that prayer involves our entire selves, mind, body, heart, and soul ascending to God not only in a mystical way but in a practical way. Blessed William Joseph Chaminade recommernds that his Brothers meditate for one hour every day. He understood meditation as vital, both for the spiritual life and for our apostolic work. According to Blessed Chaminade, this time was "meditation on the presence of God." He defined this prayer as "a calm attention to the presence of God." In order to do this during our time of prayer, Blessed Chaminade recommends great simplicity. He calls us to "this simple attention of the mind, accompanied by a gentle ardor of the heart, together with this aspiration or thrust of the heart." Such prayer overflows into our entire day and makes our day a continuation of our meditation and of our prayer. This is the seventh in a series of student reflections from the Life Teen Leadership Conference last summer. Over 500 young men and women gathered together to learn and express their faith. Life Teen was truly one of the most inspirational, life-changing, and exciting events I have ever experienced. Throughout the week there were many speakers and talks that made me think deeper into my faith and examine my life more closely. Everyday included adoration, mass, evening prayer at the famous Grotto, and music by Matt Maher. You would meet teens the same age as us interested in their faith even more than us. We got to know the other kids by playing Ultimate Frisbee and soccer with them. Throughout the week, a few events greatly impacted me and I’m sure others as well. Every day had many lectures that ranged from how to be a catholic hero to a special guy’s empowerment and ownership session. Every morning there was also the opportunity to attend Bible Study that was held by Mark Hart. The Bible Study was one of the most interesting lectures. Mark Hart was so enthusiastic into teaching the Bible to a bunch of teens. The way he spoke was so enthralling that the hour went by so fast and I was upset that it was over. Many of the speakers had this talent which made every lecture unique in its own way. Another impressive lecture was given by Christian Rock singer Matt Maher. He spoke about “Mary and the Magnificat”. This was an interesting lecture because it showed that Matt was not only a musician but that he had a lot of passion for his faith which he normally only shows through music. 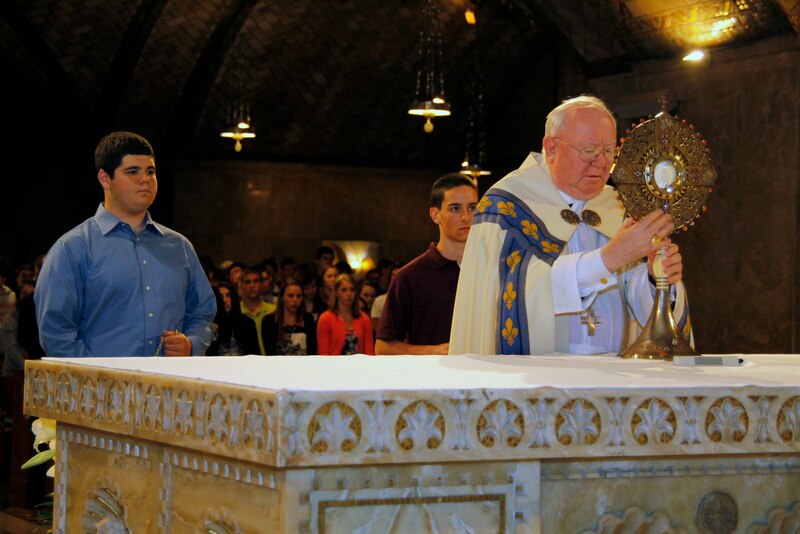 The most powerful events of the week were Adoration, Confession, and Mass. Mass and Adoration were held everyday and Confession was held only one day. Confession was like no other Confession I had experienced. I was able to really examine my conscience and told the priest things I had held back on telling before. I had about a 15 minute conversation with the priest about how I could change my life by taking out the sins I had committed. Mass and Adoration were amazing. Everyday I looked forward to these two events. Mass was amazing because everybody wanted to be there. Everybody responded and sang along with Matt Maher and the band. We were all there to give praise to our Savior and be lucky enough to receive Him in the forms of His Body and Blood. 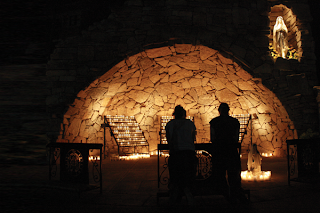 One night Mass was held at the Grotto. This was nice because the candle-lit landscape gave the Mass a certain atmosphere. The priests were also able to keep us entertained by delivering great homilies. Adoration was usually held for about and hour. This was a special time because it was quiet time with periods of reflective music provided by the band. For an hour, we were able to be one-on-one with Jesus and reflect on our lives and how we could better our life. There were many experiences throughout this one week; too many to recount. At the end of the week, we all wanted for the program to continue for another week. I hope to take these experiences from this week and use them in my future as a Catholic leader at school, in my family, and at my parish. "Mary, the Mother of God! Indeed, the divine Maternity of Mary is a profound and incomprehensible mystery. To think that it was given to a feeble creature to call God her son, and to share not indeed with a mortal spouse, but with the Eternal Father himself the propriety, I dare say, of receiving the homage and filial tenderness of Jesus Christ. Yet this is the teaching of faith: Mary is the Mother of Jesus. Let us learn, then, through the Son to know his Mother." Pentecost Sunday - Come Holy Spirit! Brother James is pictured here during Holy Week Services at Founder's Hollow. He celebrates 32 years of religious consecration. Our Founder, Blessed William Joseph Chaminade made the Marianist profession of vows a total consecration to Mary; that is, a total commitment to God according to her example to reinforce the grace of Baptism. The originality of his concept is that the consecration to Mary is not added to the religious profession, but the profession itself is a consecration to her. The two are identical. For Blessed Chaminade, "The religious state is only a more perfect manner of fulfilling the scope of one's consecration to Mary." To make this perfectly clear he joined the three regular vows of religion to a vow of stabilty, which has the special Marian sense of "perseverance in her service." "This vow is in reality a consecration to the Blessed Virgin." During the month of May, many members of the Province of Meribah celebrated the anniversary of their first religious profession of vows. All the Brothers of the Province rejoice in their fidelity to God and consecration to Mary. Below are listed the annivesary dates of the first profession of vows of the Brothers. Brother Joseph Dominic celebrates 30 years of religious consecration to Mary and the Church. Above, he lifts the Cross for the Good Friday Recessional this year. May the Father and the Son and the Holy Spirit be glorified in all places through the Immaculate Virgin Mary. Amen. Our seniors watch this film, Fireproof. This short video clip is the high water mark in the movie. Caleb finally “gets it.” He has been trying to love his alienated wife out of flesh power and, since she is not responding as well as his ego says she should, he is resentful. But in a moment of grace depicted here, he finally experiences the complete and unmerited love of God for him and thus becomes equipped to start loving his wife this way. Would that our lives were as simple as this movie describes. For most of us, finally grasping the love of God for us takes more than one chance conversation in a park. But the central point remains, we have to experience the love of God for us to live more fully under grace. The more we grasp God’s love the more we can keep his law. Sometimes we don't even see it coming. We get hit with some form of pain out of nowhere leaving us feeling desperate and helpless. That's the way life is. Still, it makes us wonder how God can let these things happen to us. How God can just stand by and watch us suffer. Where is God when it really hurts? Maybe God is actually closer to us than we think. Maybe it's when we're in these situations, where everything seems to be falling apart, that God gets an opportunity to remind us of how much he really loves us. "The resurrection of Jesus from the dead is the “euangelion,” the good news, the Gospel, and announcing it with a contagious, compelling enthusiasm is evangelization. Now one might wonder: what made this proclamation so newsy? Didn’t a number of first-century Jews—like most people today—have a conviction that there is life after death? Well, some Jews in Jesus’ time believed that the dead went to the shadowy realm of Sheol, a rather unpleasant and tedious abode. Some believed that all the dead would rise at the end of time; still others held, in the Greek mode, that the souls of the dead would live on in separation from their bodies. But the point is this: the first evangelists didn’t use any of these categories when speaking of the resurrection of Jesus. They didn’t say that his soul had gone to be with God; they didn’t say that he had journeyed to join his ancestors in Sheol; and they didn’t say that they were awaiting his resurrection at the end of time. What they said with an enthusiasm bordering on drunkenness is that the crucified Jesus had risen bodily from death through the power of God—and that this fact had changed everything. Some theologians today rob evangelization of its newsy quality by translating the language of resurrection into subjective or political categories. “Resurrection,” they maintain, is symbolic language evoking the conviction of the disciples that Jesus’ “spirit” still lives among them or that his “cause” goes on after his death. Well, if that’s all the term means, then Winston Churchill is “risen” whenever the Churchill society meets to read his speeches, and Beethoven is “risen” whenever a symphony audience catches his spirit while listening to his fifth piano concerto. The “cause” of Jesus was, in fact, shattered on the cross, and his disciples were devastated. What gave them the confidence to preach him with such vigor, even to the point of giving their lives, was what happened to Jesus, resurrection from the dead. So the resurrection is news; but why is it so good? In some ways, the 2,000-year tradition of Christianity is an attempt to embody an answer to that question, but I might make just one observation. In the resurrection of Jesus, we see that our most abiding fear is assuaged. What broods over the whole of life, mocking all of our accomplishments and relativizing all of our loves, is the brute fact of death. Jesus’ bodily resurrection shows that God’s love is more powerful than even this most fearsome of enemies. So finally, here is the question: do you believe it? If you don’t, you’re not a Christian. If you do, how can you not want to grab everyone you meet by the lapels and tell them about the resurrection? How can you not evangelize?" Never forget that the instrument God is most concerned with is your heart! This is the sixth in a series of student reflections from the Life Teen Leadership Conference last summer. Over 500 young men and women gathered together to learn and express their faith. “Last week I attended the Lifeteen Conference, it radically changed my life. My perception of the conference the days before it started painted a picture of an academic gathering with lectures about philosophy and very serious Bible studies. Of course, it would include daily Mass at the Basilica with the mundane music and the lack of participation that I experience in my parish. I was shocked wwith the conference. On Monday, I was very pleased to learn that Matt Maher was present and would play music during the week, but I reacted skeptically towards the active participation of the audience in the praise. All the standing, clapping, and dancing was to me a big joke of a prayer. Also, I was surprised by the deep insight that the first couple of speakers provided into many spiritual topics. Later in the week, I felt the power of the Holy Spirit break through my pride, my sarcasm, and my skepticism and I soon found myself praising God as enthusiastically as those guys from Texas. This week changed my spiritual life from mere adherence to the rules of the Church into a deep desire to serve and praise God. I could write on indefinitely about all I experienced during the week, but I’m just going to point out a few of the major highlights. I was struck by the powerful lectures instructing us about our Catholic faith. The theme of this year’s conference was a sign for me of God’s great sense of humor and sort of a smack in the face for me. “Heroic Virtue” struck me as the most necessary thing for my generation to have and for me personally to start practicing. I know the virtues, I know my duties, I just didn’t pay attention and didn’t act on it before. On the first day, Fr. Bob’s lecture on the nature of the Eucharist was one of the most brilliant and simple explanations of the Sacrament that I have ever heard. He explained how only the power of the Eucharist can provide true peace and true happiness and how it is this power that makes us one. Another lecture that really touched me was Mark Hart’s talk on the theology of the body. This stance on sexuality is a very unpopular and socially awkward standpoint to take especially when addressing a group of teenagers. We live with the constant bombardment of sexual media images as well as the amoral opinion that we can do whatever we want with our bodies disregarding the dignity of the sexual act and any rule of Christian morality. Also, I was instructed as much by Mark’s action of chastity until and in marriage as his theoretical explanation of John Paul’s theory. Furthermore, I enjoyed the morning Bible Studies which gave me a deeper understanding of God’s Word and how I may use it in my prayer. A more important aspect of my experience was the spiritual development and nearness to God that I went through. I felt very privileged to have the opportunity to participate in the Mass every day and to receive the Eucharist fully knowing its meaning and feeling God’s grace present in me. Also, I dived fully into the experience of Adoration both in the participatory and in the silence. In these moments I reflected on the mystery of the God of the Universe coming down to Earth to be with me. This week I really had the time to think and concentrate and pray on this magnificent revelation that I’ve so often doubted. During Adoration I encountered God’s peace and lived in it without any worries in full faith that He would take care of me. I was so immersed into prayer that many times I lost sense of time. My prayer experience was made whole on Wednesday when I had the opportunity to go to confession and to receive God’s mercy. I also enjoyed and took advantage of our nightly prayer at the Grotto. They were a great way to thank God for our day and to come together as a group in prayer. The Grotto was a place of peace and quiet for me and I made sure to go there as often as possible and get rid of all that was troubling me. The last night, I was very grateful for the prayer service that we had. I needed the prayers said over me to give me the strength to carry on and to support me in my prayers and to get rid of my doubts. The experience was shocking and I know I witnessed the power of God. "Let us entrust all to the protection of Mary to whom her divine Son has reserved the last victories over hell: “And she shall crush thy head.” Let us be, in all humility, the heel of the Woman ." "We impose nothing, yet we propose ceaselessly, as Peter recommends in one of his Letters: “In your hearts, reverence Christ as Lord. Always be prepared to make a defence to any one who calls you to account for the hope that is in you” (1 Pet 3:15). And everyone, in the end, asks this of us, even those who seem not to. From personal and communal experience, we know well that it is Jesus whom everyone awaits. In fact, the most profound expectations of the world and the great certainties of the Gospel meet in the ineluctable mission which is ours, for “without God man neither knows which way to go, nor even understands who he is. In the face of the enormous problems surrounding the development of peoples, which almost make us yield to discouragement, we find solace in the sayings of our Lord Jesus Christ, who teaches us: ‘Apart from me you can do nothing’ (Jn 15:5) and who encourages us: ‘I am with you always, to the close of the age’ (Mt 28:20)” (Caritas in Veritate, 78). When Mary said to the Angel “Fiat mihi secundum verbum tuum” (let it be done to me according to your Word she accepted God’s plan for her and all of us. Her "fiat" changed the whole world. We have hope in our own lives today, because Our Lady said "yes." What we have to remember is that our own "yes" today will also have an effect on the world around us. Mary's "yes" and ours, too, come with a risk. It means surrendering to God's plan in our lives and giving ourselves over to the mystery of God and His great love for all of us. Like Mary, God is calling us to live a life of holiness. This life of holiness may even be calling us to a vocation in His Church. We have the ultimate choice, to say "yes" to Him. When we are discerning this calling, Mary is the perfect example of answering the call and saying "yes" to God. 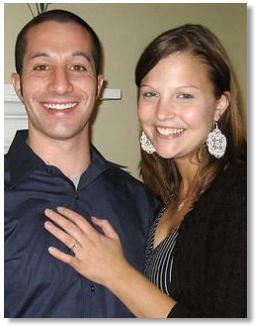 She had the the courage to say "yes" to God, and she did. God gives all of us the same virtue that He gave to Mary. The next time that you’re praying about your vocation, think how Mary said "yes" to God and how much courage that took for Her to do. During this month of May, we honor Mary for accepting His call to live a life of holiness. Will you say yes to God? Yesterday was the feastday of Our Lady of Fatima. On May 13, 1917 ”a Lady all white, more brilliant than the sun” appeared to three children tending sheep in the Cova da lria in Portugal. It was just eighteen months before the end of World War I. This was not the first time a supernatural visitor had appeared to the children. Some time earlier an angel called the “Angel of Peace” had come three times. He had given them Holy Communion and had exhorted them to pray and make sacrifices. Tenderly, the beautiful woman told the children not to be afraid; she would not hurt them. Lucia, the oldest of the three children, asked the woman where she had come from and what was it she wanted. The lovely Lady told her that she had come from Heaven and that she wanted the children to return to this same spot on the 13th of the month for the next six months. At the last visit, she would tell them what she wanted. And so began the famous and incredible apparitions of Our Lady of Fatima. Dutifully, the children returned to the Cova da Iria in spite of persecution, misunderstanding, ridicule, and impossible obstacles. And faithfully, month after month, the Blessed Mother appeared to the children entrusting to them secrets, revealing to them visions, and giving them prophetic words. Many people had come to the Cova to be healed and Our Lady said that some would be healed but others would need to amend their lives and ask pardon for their sins first. “Let them offend Our Lord God no more, for He is already much offended.” These were her last words. Then the miracle began. As the crowd looked up into the sky, the clouds rolled back to reveal the sun. Suddenly, it was a white disc of light, its brilliance shrouded, so that all could gaze upon it. During this time the children saw a tableau in the heavens, with one scene after the other depicting the mysteries of the Rosary. They saw the Holy Family with the Christ Child in the arms of St. Joseph, who blessed the crowd three times. Lucia saw Our Lady of Sorrows and then Our Lady of Mount Carmel. The sun began to dance in the sky, twirling and whirling, shooting rainbow-colored rays all over the earth. Within three years, the two youngest of the children, Jacinta and Francisco died, as Our Lady predicted they would. Lucia, the oldest and the spokesperson, stayed at home with her family until she was fourteen. She eventually entered religious life and died on February 13, 2005 at the age of 97. The Ascension of Christ - Be witnesses! 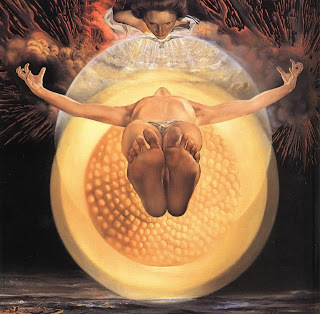 Dali said that his inspiration for The Ascension of Christ came from a "cosmic dream" that he had in 1950, some eight years before the painting was completed. In the dream, which was in vivid color, he saw the nucleus of an atom, which we see in the background of the painting. and a cloud took him from their sight. why are you ... standing here looking into the sky? Jesus ... has been taken up from you. Today we are called to see the work of the Father, and the Son, and the Holy Spirit! The Apostles just stand there looking, staring, even waiting and this is precisely what God asks of them. It is only when they receive power from on high that they become something - witnesses - to all they have seen and heard and received. Don't you see? It's all God's work and, consequently, we are all God's work. Just as with the Apostles, the Father completes his work in us by the gift of the Holy Spirit. It is the Spirit who gives us power to become all that we can be, all that we should be. In spiritual terms this means becoming witnesses to Christ in the lives we lead and the words we speak. So if you are feeling powerless, out of control, hopeless, don't despair and don't try to play Mr Fixit. Stay put and wait in prayer, and "you will receive power." Be patient, do what you can, pray - and don't give up! "The Church, the Fathers, Catholic tradition—all bid us look up to Mary as our advocate and mediatrix. Thus the Church always applied to Jesus the example of the great King Solomon who, in the days of his glory and his wisdom, entrusted to his mother the exercise of his royal authority. Likewise, throughout the centuries, Christians have ever regarded Mary as their Queen, their helper in every need, their life, and their hope." Each year one of our religion courses explores the topic of Christian joy. Our students discover that true happiness is a quality that we inject into our work. It is not something we derive from our work. When we work only for ourselves, we begin looking for happiness outside of ourselves. Trying to achieve happiness that way doesn’t really work. But when we work for another’s benefit and turn off the "What's in it for me?" attitude, we begin to tap into the deep wells of happiness that are already inside us. Happiness flows then outward from us and into the work we do, so we experience it as an outflow, not an inflow. Happiness is something you exhale, not something you just inhale. Now this is what Jesus implies in The Parable of the Talents. Creating an abundance requires you to move outside of yourself. It requires you to move beyond fear. If you are too fearful or suspicious or distrustful, you are going to bury your talents. And this leads to “weeping and gnashing of teeth,” for example sorrow and depression. You might think that fear and suspicion will keep you out of trouble, but really they’ll just cause you suffering and pain. You don’t need fear to avoid being a gullible idiot; for that you just need common sense. To live a life of abundance, you must ultimately move beyond fear and work to create abundance for others. Otherwise you’ll ultimately be cast out as worthless. Jesus doesn’t pull any punches here, youse bums. Serve to create increase for others, and happiness is your reward. Bury your talents, and you get “weeping and gnashing of teeth.” The choice is yours. Here's a good use of talent. Rob Surette was at one of our schools last Friday. He has been there a number of times, and each time he is mesmerizing. One thousand students are at the edge of their seats watching a man express his talents in a spiritual way. God wants your heart, NOW! This is the fifth in a series of student reflections from the Life Teen Leadership Conference last summer. Over 500 young men and women gathered together to learn and express their faith. Surrounded by people actively praising God and hugging strangers, I began to wonder whether my decision to attend the Life Teen Conference was the right one. Sure, I was Baptized, Confirmed, and even attend church on Sundays. Still there seemed to be an obvious gap between my religious devotion and that of other students who were there. After all, during Mass, as I outwardly genuflected during the consecration of the bread and wine (into the body and blood of Jesus Christ), my mind wandered to the next day’s regatta and how my rowing team would perform. Sometimes I am not even sure God truly exists. But here, people seemed perfectly comfortable not only in their acknowledgement of God, but in their open celebration. I turned to my friend who was looking back at me with the same alienated expression. But there wasn’t much time to lose ourselves in thought. After settling into the dorm room I joined the Mass of devotees to listen to the opening speech. With a final Amen, my initial sense of discomfort became amplified. The place was now flooded with swoons and shouts of : “Praise God!” The louder the crowd screamed “amen,” the smaller, somehow, I felt. When the talk was over, my friend and I almost ran to the safety of the dining hall. Here at last was something I could relate to… dinner. With a full stomach my mood began to improve. I did not even mind when this robust guy almost crushed me with his bear hug, and I was also even willing to give up some praises. While I was having fun, I still had not even come close to being sold on the role of God in everyday life. If my being here was indeed God’s will, I was hoping that God would save me the embarrassment of falling asleep during adoration. As I entered Debartalo Hall I stared blankly at the monstrance on the altar, still not expecting much. But as soon as the Body of Christ was placed into it, by no act of man, everything changed. Previously, the four measly candles surrounding the empty monstrance were dim and dull, but with the presence of the Body of Christ, I felt as if a one thousand volt lightbulb was installed in the center, illuminating the darkness. Things also changed inside of me as well. I felt as if God came out and knocked me on the head saying, “I am here. I am right in front of you. I have always been here.” Suddenly the sense of worry about belonging, not only here, but outside of here as well, began to dissipate. My concern about where I belong came more fully into view. My mind, which had often been filled with trivial thoughts, finaly settled down. Whether or not my team would win future rowing competitions, and thoughts of that sort now took a back seat. As I stopped thinking about escape and diversions, I even began to sing, write in my journal and join in the dancing that didn’t seem too ridiculously embarrassing. Although I recognized God was active in my life, I still had no idea what role He would play. The next day at four in the afternoon, after an incredible lunch, we listened again to the keynote speaker. During his presentation, he asked us to leave and find a relaxing place to write what we would give God permission to do in our lives. I reclined against a matte grey concrete ledge outside Debartalo Hall to contemplate. I thought about my relationship with Jesus Christ. I had an epiphany. I was always asking Him for something that I thought I would need: greater strength, more intelligence, better musical aptitude, and top grades in school. I realized that religion had been all about me, my needs, rather than about God, and my relationship with Him. Instead of asking God to make me the person I had hoped to be – and often worried about becoming – I began giving God the permission to mold me into the person He set out to create. I am still in the process of discovering who that person is, but seven hundred fifty miles away, I have finally found my way home. If I had the ability to experience the week over again, I would with no questions asked. That one week was the best I ever had! "Let us therefore join with heart and mind in the universal homage that is being paid to Mary. Let us honor her, let us kneel in deepest reverence before her altars, and pour out our humble supplication with filial confidence in her powerful mediation." As Marianists we call Mary our Mother. But how is she our mother? 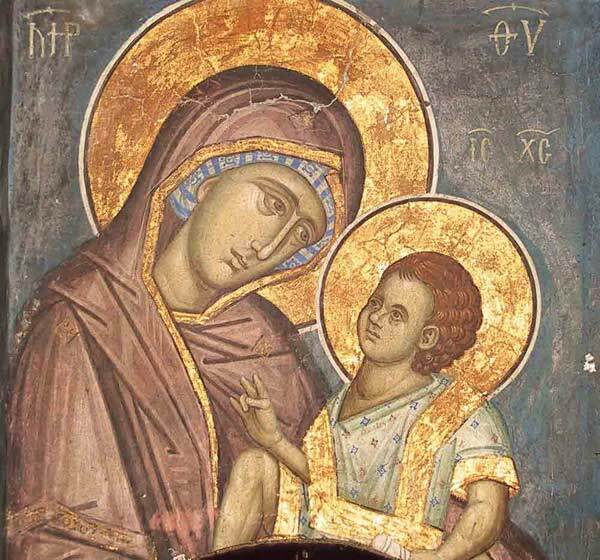 Granted, Jesus announced her as our Mother when he said to John from the Cross, “Behold your Mother.” John represents all disciples and hence when Jesus declares Mary to be his Mother, He also speaks to us "Behold your Mother." But still the question of how is Mary our mother. Jesus does not simply declare her to be so in some arbitrary way. The most simple answer is this: Mary is our mother because she is the Mother of Jesus and we, by baptism are incorporated into Jesus. Now we are Christ’s body, and individually parts of it. Jesus is the head of the body, the Church. But if Mary gave birth to the head of the Body of Christ she also gave birth to the rest of the Body of Christ. What mother do you know who ever gave birth to the head of her child but not the rest of that child’s body? So if Mary is the Mother of the head of the Body, she is also mother to the members of the body. Why? Because of Christ is one and we are one in Christ. Mary is Mother of Jesus, we are in Jesus, Mary is thus our Mother. It is not some mere sentimental thing. It is a real motherhood. What is the best gift you can give your mother on Mother’s Day? Scripture surely gives the best answer: Let her who bore you rejoice. In other words the best gift we can give our mothers is to live a life that would make them proud. The Blessed Mother has told us what she wants: Do whatever He tells you. So the flowers may be nice, the dinner, a phone call, essential, but the best gift for our mothers is a beautiful and holy life. "The secret of success in any work, whether it be for one’s own perfection or for the support of religion and the propagation of the faith, is to interest the Blessed Virgin in it, to refer all the glory of it to her in accordance with the views and sentiments of our Lord Jesus Christ." This video produced by Spirit Juice Studios was debuted at the Illinois Catholic Prayer Breakfast. It is simply beautiful. One of the earliest doctors of the Church has truly said: “There is no father like God.” May we not borrow his words and say of the august Virgin Mary that there is no mother like Mary? EASTER JOY: Run into the arms of Christ! This past weekend graduating class of 2010 from Kellenberg took the annual senior trip to Disney World. For three days, we functioned on little sleep and soaked in every ounce of magic Disney had to offer. I am very grateful for the trip, especially the times where we had exclusive use of many rides in the park. Not too many people can say they have rocked the Rockin’ Roller Coaster nine times in one night, huh? Well, I can honestly say I can write all about the awesome and funny times my friends and I had down there (I spoke for two hours with my mother and sister all about the trip last night), but I will focus on one experience. On Thursday afternoon when my friends and I arrived in Downtown Disney, I got out my little map and route the way to the oversized Disney shop. 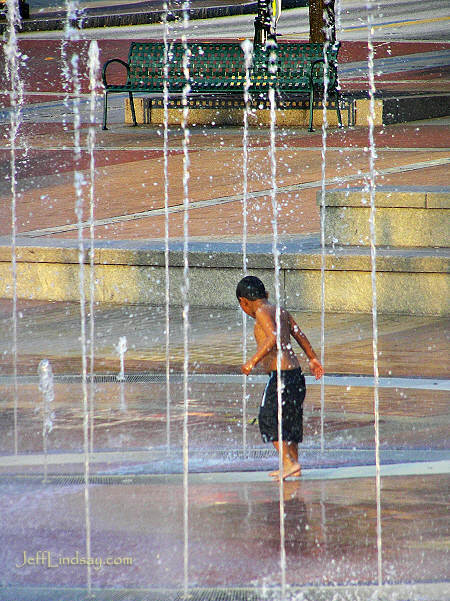 I take a few steps into the park and notice a small circular area with holes in the ground for water to shoot up a few feet in the air and in which kids play. I looked at it, thought “Would ya look at that, how cute,” and was ready to move. But, God seemed to throw a curveball. I saw out of the corner of my eye a toddler, I’d say about the age of three, run into that area all alone. 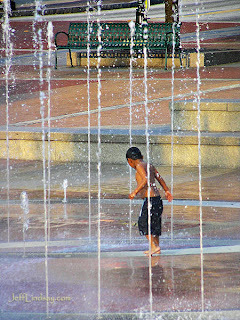 He jumped around, ran from hole to hole covering them up with his feet as water splashed out of them. As his family watched, my friends yelled out my name “Come on, man,” My mind began to race back to my first trip to Disney World when I was only four years old. Was I like this little kid? Jumping around, having fun, totally enraptured in the fun and truly magical times that Disney has to offer? I couldn’t help but smile. What an incredible gift it is to experience this type of joy, especially in what is said to be the happiest place on earth. Jesus teaches us in the Gospel of Matthew this very simple and important message – “Amen, I say to you, unless you turn and become like children, you will not enter the kingdom of heaven” (Matthew 18:2-3). I never really totally understand this concept until I saw what happened in Downtown Disney. But I understand now. Jesus is telling us to just be…just live in the moment. Enjoy things just like little kids do. I am truly blessed that I was able to experience the joy Jesus talks about for three days with my classmates in Disney. Jesus calls us to experience this joy in our religious vocation. Easier said than done it seems. But go ahead, splash, jump, and run into the arms of Christ. Welcome my friends, to the joy of a religious vocation. "Mary is present. She is watching over us with maternal solicitude, making herself all to all, and apportioning her help according to our needs. She is the strength of the weak, the foot of the lame, the eye of the blind, the ear of the deaf. She enriches the poor, protects the timid, disarms the angry, touches the heart of the ungrateful, and never abandons anyone. Virtue, it is true, is the object of her complacency; yet the sinner finds in her a shelter and a refuge against the wrath of heaven." I just love the way God sends me reminders that He cares for me and that He is in charge of my life, watching out for me. God is concerned about you and actually has great things planned for your future. It is hard to believe sometimes when we are in the midst of life, especially when it appears that uncertain times are ahead. We must always remember though, that our lives really aren't our own. After all, God does have plans for us here. We just need to discern how we are to carry out His wishes. For example, I believe God is calling me to accept a religious vocation. God’s plan for me started in my own household. My parents insisted we go to Mass every Sunday. In 5th grade, I became an Altar Server and in 8th grade I became a Lector. As a Mass lector and server I give a valuable service to God and His Church. I am still very active in these two ministries of the Church. After 6th grade finished I had a decision to make; should I go to my public school or should I go to Kellenberg for 7th Grade? So I applied to Kellenberg and I was accepted. At Kellenberg I continued the service that I started in my parish. Whether it is serving food at a dinner or assisting at the monthly school Mass, I continue to offer service to my school. In addition, Kellenberg has given me so many opportunities to improve my faith life. Daily Mass, Midday prayer, Holy Hours at the Seminary, XLT, and Eucharistic Adoration on Mondays, have helped my faith life increase tremendously. The opportunities to develop spiritually just kept knocking at my door. As a junior, I was given the opportunity to go to the March for Life and the Diocesan Pilgrimage. Both were great experiences in my faith life. Finally, I was recently commissioned a Eucharistic Minister, which was probably the greatest step in my faith life. Now, God sometimes plants certain people in your life. This past year I met a newly ordained priest at my parish. I have become great friends with him. He is a great person to talk to about my faith and he has introduced me to things I have never known. For example, I experienced my first Holy Thursday Chrism Mass at Saint Agnes Cathedral . These opportunities are all part of God’s plan for me. When I think about all that has happened in my life and all the opportunities that God has given me, I am so grateful. Because I chose to attend Kellenberg, and because I chose to become friends with the priest in my parish, my faith has grown significantly. Partaking in these opportunities has allowed me to grow in many ways. God has a purpose for me. I need to discover what that purpose is for me. We are accused of pompously eulogizing Mary and are blamed for the honor we render her . . . Can we really assert too much, do too much, provided that we do not declare her equal to the Divinity, provided that we make a distinction between worship of her and that of the Divinity? What hath God said of Mary? What hath he done for her? He is our model! "We have recently received word that an official Archdiocesan Tribunal in St. Louis will soon hear testimony in connection with the cure of Rachel Baumgartner Lozano from a very aggressive form of cancer. Rachel, members of her family and some friends maintain that this cure was the miracle that they prayed for through the intercession of Blessed William Joseph Chaminade. Her doctor strongly feels that, despite extensive medical intervention, Rachel’s cure is inexplicable. Last January, Marianist Procurator General, Fr. Antonio Gascón, SM, and Bro. Michael McAward, SM, Secretary General, met with diocesan officials to present the case for consideration. Having accepted the formal request to open the case, Most Rev. Robert Carlson, Archbishop of St. Louis has formed the special Tribunal. The purpose is to gather all testimony and evidence in the case and prepare it to be sent to the Holy See in Rome for final adjudication. The final decision will rest with the Holy Father following study and recommendations made by the Congregation for the Causes of Saints. While the ultimate decision in this matter remains to be seen, the cause for the canonization of our blessed Founder awaits one more miracle attributed to his intercession. Oh, if we could but realize the exalted dignity of the Mother of God; if we could but grasp the full extent of the maternal solicitude with which she looks down upon us, her children, whom her divine Son has confided to her care; if we could but read in her Immaculate Heart all the designs of her loving tenderness for saving the world from the universal deluge that menaces the faith and morals of the nations; we should be more intensely devoted to her service, her name would be more frequently and more lovingly in our hearts and on our lips, and we should experience, with great joy and thankful remembrance, the wonderful effects of her magnificent power and love. EASTER JOY: Say it and mean it! Have you ever said a memorized prayer similar to the "Our Father" and never really meant it? Perhaps you have said a prayer before class and just gone through the motions. Or maybe prayed at an event just to get it over with and never put much effort into the words. Well, I had a similar experience with one of my passions. I love to sing and play piano. One of the most widely used words in music is musicianship, basically it means putting your emotions behind a song and making it mean something. I remember one time last year our moderator explaining the difference between "singing" a song at Mass and just going through the motions of singing a song. Obviously when someone places a conscious effort into our song it can change a whole song. Let’s take one of my favorite songs, “Awesome God.” People freak out when the song is played! Everyone knows the words. How much more intense would it sound if we consider the important things God has done for us as we sing this song. So when we sing this song, or any religious song for that matter, sing what we mean, understand it, know it, put our emotions behind it, and maybe use a little musicianship because, don’t forget, our God is truly an Awesome God. "In the enthusiasm of our gratitude, our hearts burst forth into a glorious hymn of love and admiration. Who indeed could adequately praise Mary? Or should anyone fear to exceed due limits in exalting a creature so supremely privileged?" This is the fourth in a series of student reflections from the Life Teen Leadership Conference this past summer. Over 500 young men and women gathered together to learn and express their faith. “I have to admit I knew very little about what I was getting into when I arrived Sunday morning. I had no idea who the Kellenberg students were let alone what they were like and except for a few, I only vaguely knew the rest of the Chaminade students. When we arrived at the Life Teen Conference I was awestruck by the size of the campus. I was also amazed by the student-run Mass and that in the middle of the summer the students still went to Mass in pants and collared shirts. To be perfectly honest I was freaked out by the next day when we arrived at the lecture hall with Matt Maher playing. It seemed eerily familiar to a video I had watched in Sodality. We all adjusted to the music and style of worship. I also felt that as the week went on I got to know all the Chaminade and Kellenberg students and developed some new friendships that have carried into the new school year. My favorite day of the retreat was Wednesday when Mark Hart gave a talk on Theology of the Body, and we also heard a talk on Male Empowerment. The part of the day that moved me the most was confession because it was the first time a priest took a considerable amount time to talk me during Confession. Sadly the week came to an end and I did feel myself falling off of a retreat high. Of course I am only human and fell back into the midst of sin but with a more aware mindset that hopefully causes me to sin less and in a less severe manner." "God has placed the treasury of graces procured by his blood into the hands of Mary, who, as the mother of a great family, distributes them according to our needs, our circumstances, and our fidelity. Thus nothing comes to us from heaven except through the mediation of the Blessed Virgin. She is the channel that receives and transmits to us the beneficent waters of divine grace." Fr. Francis Keenan, Bro.Peter Heiskell, Bro, Michael McAward and Bro. 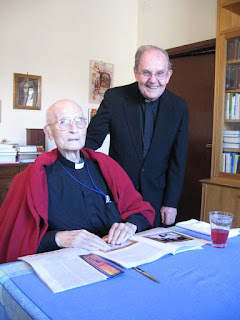 Michael Gillen visited Cardinal Mayer in October. He had been a friend of the Province of Meribah for over thirty years. VATICAN CITY, April 30, 2010, The Holy Father has sent a telegram of condolence to Fr. 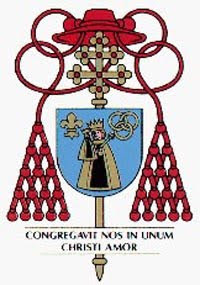 Notker Wolf, abbot primate of the Benedictine Confederation, for the death today at the age of 98 of Cardinal Paul Augustin Mayer O.S.B., president emeritus of the Congregation for Divine Worship and the Discipline of the Sacraments. The late cardinal, writes the Pope, "leaves the indelible memory of an industrious life spent with mildness and rectitude in coherent adherence to his vocation as a monk and pastor, full of zeal for the Gospel and always faithful to the Church. While recalling his knowledgeable commitment in the field of the liturgy and in that of universities and seminaries, and especially his much appreciated service to the Holy See, first in the preparatory commission for Vatican Council II then in various dicasteries of the Roman Curia, I raise fervent prayers that the Lord may welcome this worthy brother into eternal joy and peace". "We never give more honour to Jesus than when we honour his Mother, and we honour her simply and solely to honour him all the more perfectly. We go to her only as a way leading to the goal we seek - Jesus, her Son." The months of October and May are usually dedicated to the Blessed Virgin Mary. As a community of faith united to the person of Jesus Christ, our Province affirms a special devotion to His Mother, Mary, the first disciple. Because of her fiat we cherish the Blessed Virgin as a precious model and strive to imitate her disposition to service and her habit of contemplation. In prayer we keep all things in our heart which the Redeemer suggests to us when we seek Him, just as our Blessed Mother did. In our places of ministry and apostolic work, we strive to form men and women more fully in the image of Her Son. In our enthusiasm for our work, in our devotion to prayer, and our hospitality towards others, we seek to be like her so that we might also become like her Son. At the beginning of each day we consecrate ourselves to Mary with a formal act of consecration. The prayer below is today's consecration. your Son for the salvation of all. "Behold the servant of the Lord." places through the Immaculate Virgin Mary. Amen.